The PlayStation 4 Taiko no Tatsujin game. Taiko no Tatsujin: Drum Session! is coming to PlayStation 4 in the Americas and Europe via the PlayStation Store alongside Taiko no Tatsujin: Drum ‘n’ Fun! for Switch on November 2, publisher Bandai Namco announced. Play With Your Friends – Play with a friend in co-op and versus mode, or play online with ghost data of your friends to see who can achieve the best score. Ranked Mode – Connect online and test your skills against the ghost data of Taiko players all over the world to see who is #1. Many Characters Available – Play Guest Session using characters such as Hatsune Miku, Heihachi Mishima, and more. Enjoy an Iconic Song List – Over 70 songs featuring Dragon Ball Z, Neon Genesis Evangelion, Frozen, and many more! Unlockable Content – Play through the game and unlock costumes for Taiko series mascot Don-chan, sound effects, and greetings. Hello everyone, I am the producer for the PS4 version of Taiko No Tatsujin, Ayano Ueda. Taiko No Tatsujin was released in 2001 in Japan as an arcade game. This is the first time that we’re releasing the series in Europe. On PS4, you will be able to battle online with ghost data of players all over the world. There are also Japanese popular anime songs such as Dragon Ball, One Piece, and Attack on Titan, so it would be great if you also enjoy playing those songs as well! Please look forward to the release of the game! Hello, this is Takehito Sasaoka from the development team of Taiko no Tatsujin. It has been 18 years after Taiko no Tatsujin showed up in arcades in Japan for the first time. Taiko no Tatsujin was born with the concept of “Anyone can easily enjoy playing Taiko with rhythm of music.” After 18 years later, I wish that everyone in the world enjoy this series as one of the representing Japanese games. Please enjoy and play the game with the kawaii characters including Donchan! Featuring songs from Neon Genesis Evangelion, Disney including Frozen and Zootopia, Kemono Friends, Osomatsu San, Hatsune Miku and even Touhou Project, we haven’t forgotten to include some of our own series as well like Tekken, Tales of Berseria, Ridge Racer, and Idolmaster! My personal favorite song to play is Zenzenzense from the movie Your Name! Do you have a significant other who’s not really into Japanese music? The classical song category is the perfect gateway to get them hooked on Taiko. With the likes of Rossini, Offenback and Carmen, these familiar tracks are great to get accustomed to the game’s mechanics and presentation. Afterwards, get them set up playing Pen-Pineapple-Apple-Pen and sit back in delight as they experience that crazy song! 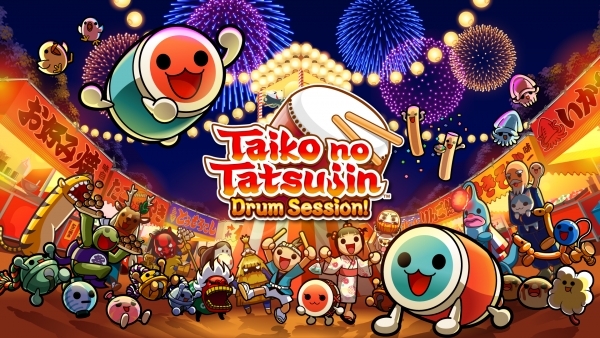 Update 07/30/18 at 4:20 p.m.: Bandai Namco has confirmed to Gematsu that Taiko no Tatsujin: Drum Session! will be a digital-only release in the west.